But to what extent can we be confident that this is how the ‘global average surface temperature’ (GAST) anomaly actually evolved over this time frame? The truth is: We can’t. At all. “What is stupid and cowardly is how Kristian refuses to confront the reality that the experts disagree with him about what we actually OBSERVE. “Kristian, you have tried to draw conclusions from 33 y of data that you’ve stitched together by making various choices about offsets between the sets. “But as I showed you, and you ignored, Loeb and collaborators have made different choices to produce a continuous set. And do not draw your conclusions. 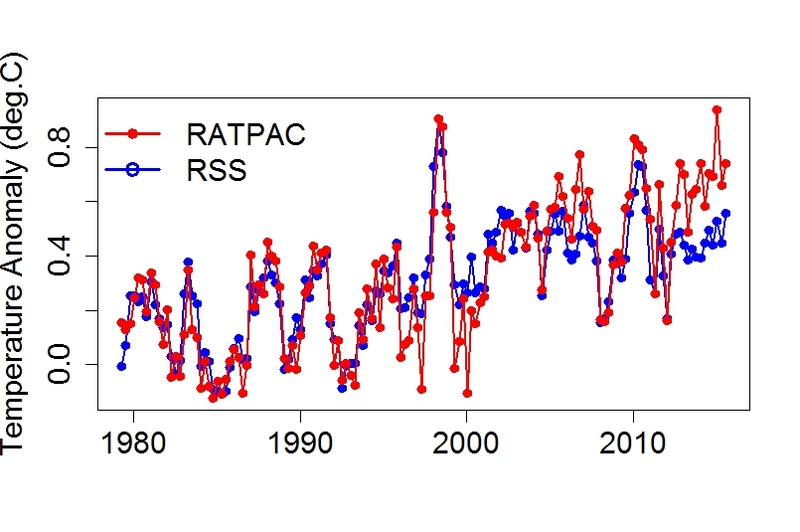 A good month ago, the perennially unsavoury character calling himself Tamino once again tried to hold up the spotty “global” network of radiosondes (weather balloons) as somehow a better gauge of the progression and trend of tropospheric temperature anomalies over the last 37 years than the satellites, by virtue of being essentially – as he would glibly put it – “thermometers in the sky”. So his simple take on the glaring “drift” between current surface records and the satellites over the last 10-12 years is this: The surface records are right and the satellites are wrong. Why? Because the surface records agree with the radiosondes while the satellites don’t! The radiosondes implicitly – in his world – representing “Troposphere Truth”. And so, when your starting premise goes like this: the radiosondes = thermometers in the sky = troposphere truth, then any “drift” observed between them and the satellites (as in Fig.1 above) will – by default – be interpreted by you as a problem with the latter. There is, however, a definite issue to be had with this line of argument. Ten days ago, Nick Stokes wrote a post on his “moyhu” blog where he – in his regular, guileful manner – tries his best to distract from the pretty obvious fact (pointed out in this recent post of mine) that GISS poleward of ~55 degrees of latitude, most notably in the Arctic, basically use land data only, effectively rendering their “GISTEMP LOTI global mean” product a bogus record of actual global surface temps. “The SST products OI V2 and ERSST, used by GISS then and now, adopted the somewhat annoying custom of entering the SST under sea ice as -1.8°C. They did this right up to the North Pole. But the N Pole does not have a climate at a steady -1.8°C. GISS treats this -1.8 as NA data and uses alternative, land-based measure. It’s true that the extrapolation required can be over long distances. 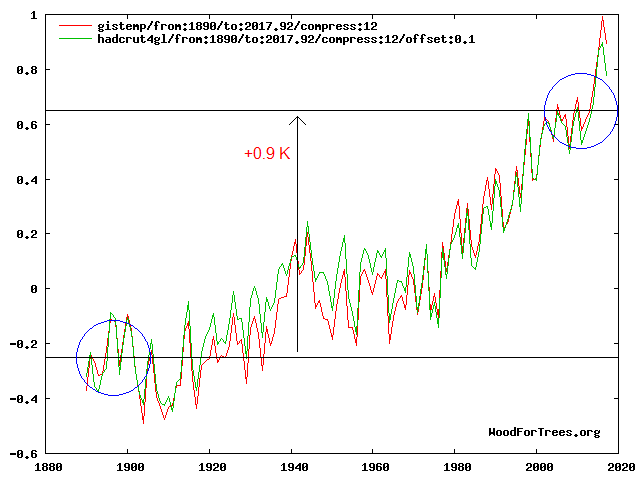 But there is a basis for it – using -1.8 for climate has none, and is clearly wrong. The upper red curve represents the final 46 years of the temperature record most frequently presented to (and therefore most often seen by) the general public: NASA’s official “GISTEMP LOTI global mean” product. 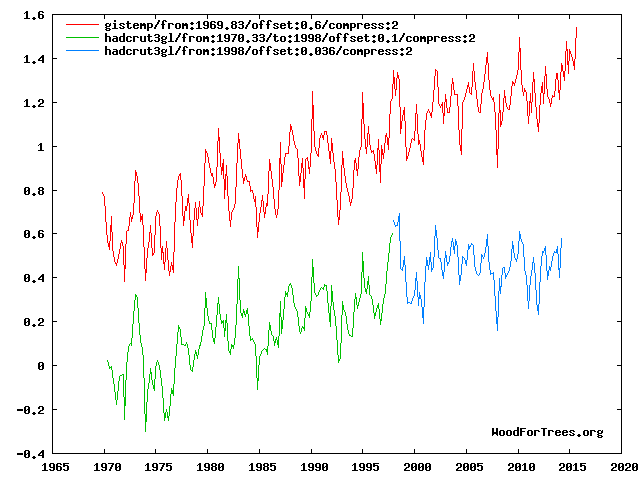 There is hardly any “pause” in ‘global warming’ post 1997 to be spotted in this particular time series. It is the one predictably trotted out whenever an AGW ‘doom and gloom’ activist sees the need to ‘prove’ to a sceptic that “global warming” indeed continues unabatedly and rub his face in it. This particular curve is simply the now defunct UEA/UKMO land+ocean product “HadCRUt3 gl” with an en bloc downward adjustment of 0.064 degrees included from January 1998*. The “Pause” is here vividly seen as but one (albeit an extended one) of several plateaus in an upward, distinctly steplike progression of global temps since the 70s. * I discussed here why this is a necessary adjustment. Now, which one of these two renditions is more honest in its attempt to depict the actual “reality” of things? And which one is the result of simply inventing extra warming? The following analysis uses data acquired from KNMI Climate Explorer and WfT. The pressing need for ever-upward temperature adjustments … A matter of life or death to the AGW hype. As you can clearly see, the two curves generally follow each other in remarkable style all the way from 1860 till today, except for the relatively sudden and substantial global upward shift taking place across the last half of the 60s, being firmly established by the end of 1970. After this point, the curves are back to tracking each other to an equally impressive degree as before the shift, only now with the global raised 0.25 degrees above the North Atlantic.